That Devil Music: Real Gone revives long-lost John Hammond LP! Our friends at Real Gone Music have announced their October 2016 release slate and one title immediately jumped off the page at us – John Hammond’s Mirrors album, which will be reissued on October 7, 2016. Originally released in 1967 by Vanguard Records, it’s the last of the legendary bluesman’s 1960s-era albums for the label to be reissued on CD. Mirrors was pieced together with outtakes from previous sessions for earlier Hammond albums like Big City Blues and So Many Roads. The two sides of the original vinyl album were divided between electric and acoustic blues performances, with the ‘electric’ side featuring talented friends like Levon Helm and Robbie Robertson of the band, Michael Bloomfield (playing piano), and harp wizard Charlie Musslewhite backing Hammond while the ‘acoustic’ side is just the singer and his guitar. The tracklist for Mirrors represents a literal playbook of blues and blues-rock standards, including tunes like “Statesboro Blues,” “Keys To The Highway,” and “Death Don’t Have No Mercy” that were later recorded by artists like B.B. King, John Mayall, the Allman Brothers Band, Derek & the Dominos, and the Grateful Dead, among others. 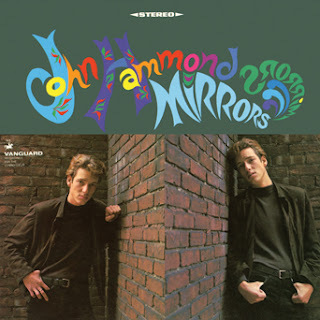 Hammond also put his skills to the test with covers of Robert Johnson’s “Traveling Riverside,” “Walking Blues,” and “Stones In My Passway.” The Real Gone reissue of Mirrors has been re-mastered for CD by engineer Joe Tarantino and features liner notes by writer and music historian Richie Unterberger including extensive quotes from Hammond. Check out the tracklist below and then order yourself a copy of Mirrors, a near-classic collection that’s been lost far too long!